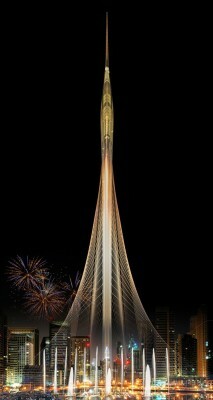 Celebrated architect-engineer Santiago Calatrava won the competition to design an observation tower for the Dubai Creek Harbor development in the city. 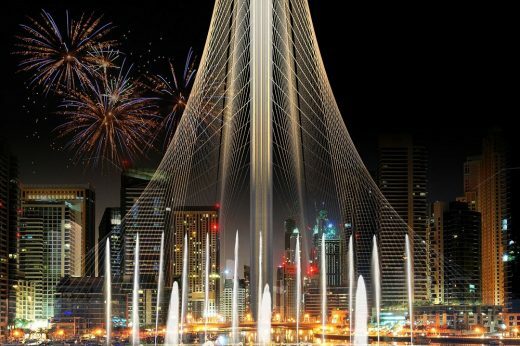 Calatrava’s winning design was met with approval this past weekend from Mohammad Bin Rashid Al Maktoum, the Vice President and Prime Minister of the United Arab Emirates and Ruler of Dubai. ‘This architectural wonder will be as great as the Burj Khalifa and the Eiffel Tower,’ he commented on Calatrava’s proposal. Selected out of six proposals, Calatrava’s scheme is described as a combination of modern aesthetics and stylistic elements inspired by Islamic architecture. The observation tower will be the centerpiece of Emaar Properties’ Dubai Creek Harbor masterplan being constructed near the Ras Al Khor Wildlife Sanctuary. Emaar Properties (who also developed the Burj Khalifa) will develop the observation tower with Dubai Holding. Details like the tower’s official name and the proposed height are yet to be revealed (Will the tower be obscenely tall like the renderings suggest?). Emaar Properties chairman Mohamed Alabbar states that construction is expected to begin within the next few months, as reported by The National.